A polo team consists of four riders and their mounts, with play occurring in 7-minute periods called “chukkas”. Most polo matches extend over six chukkas, although different leagues do play over four or eight chukkas instead. The game is played on horseback and requires considerable skill, both from rider and from mount.The game is believed first to have been played in Persia, possibly even before the birth of Christ, and began as a training exercise for cavalrymen. It became a national sport in Persia, played by both women and men, and the game’s coverage gradually extended across Asia, from Turkey to Japan.The modern game of polo was formalised by the British, but was probably derived from a version of the game played in the Indian kingdom of Manipur, in the south eastern Himalayas. Military officers came across the game and imported it to England in the 1860s. Polo clubs were gradually established throughout England, Western Europe and the Empire, and also became popular both in Argentina and in the United States of America.The polo field is 300 yards long and either 200 or 160 yards wide. The goals are 80 yards apart and the object of the game is simply to score the most goals by hitting the ball with the rider’s mallet between the goalposts. Specially trained polo ponies are used, though in fact the mounts are generally full sized horses, selected for a combination of speed, stamina, agility and manoeuvrability. Equestrian and portrait artist Susan Crawford was born in Scotland. Her father was a racehorse trainer and she grew up on the family farm, inheriting her parent's affinity with horses and the countryside and learning to ride when she was only a toddler. She spent two years at the Florentine drawing school of Signorina Nera Simi but is an entirely self-taught painter, using a classical old master technique of applying oil in thin glazes. Her main inspiration has come from the works of the very classical horse painters George Stubbs and Sir Alfred Munnings. Susan Crawford has exhibited at a number of distinguished galleries throughout the world, including The National Portrait Gallery, The Royal Academy of Arts, The Tryon Gallery, London and The National Gallery of Pahang Penang, Malaysia. 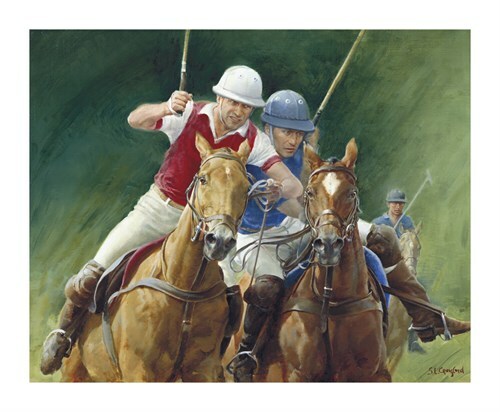 Amongst her many fine works, Susan Crawford has painted a collection of twenty-two Epsom Derby winners and steeple-chasers such as the all time favourites, Red Rum, Arkle and Desert Orchid. However, despite her high profile as a painter of horses, she is also a well-established portrait artist. She has painted five members of the British Royal family, including HM Queen Elizabeth the Queen Mother, HM The Queen and HRH The Prince of Wales, as well as HH The Sultan of Brunei and HM The Sultan of Oman. Susan Crawford lived for a time in the Middle East but has now returned to the Scottish Borders, where she paints and indulges in her favourite pastimes: horse-racing; dogs; birds; and shopping for antiques.